I am beginner in arduino i am trying to make arduino as a hid keyboard i have tried flip 2.4.6 by installing in my pc and trying to connect with usb but it is showing as can't open the port . Please help in finding which flip version is suitable . I will be very much grateful to you . Surely, FLIP is just a tool for getting your code into a chip? Arduino has that capability already built in, doesn't it? The USB link on an Arduino is a dedicated CDC-ACM converter. As far as I know there's no way to make that operate as any other class of USB device such as HID. Now some later Arduini actually use an atxmega32U4 I believe and while it's programmed by default to be CDC-ACM there is a remote possibility that might be reprogrammed to act as HID. But if you did that you would likely break the reprogramming route CDC_ACM->bootloader->flash so you might need an external programmer. To be honest it might be easiest to do V-USB and just bit-bang HID on a couple of IO pins - but you would probably need to "turn off" the rest of the Arduino infrastructure so it's timers didn't "get in the way" of the tight timing constraints that V-USB has. if you look at the second column of "host interface" it tells you what chip is being used for the "UART bridge" - any that mention 8U2, 16U2 or 32U4 in that column *may* be reprogrammable to change the UART bridge (CDC-ACM) to be HID instead. But, like I say, if you start messing with the programming of the bridge you will probably break its bridge operation (though "dual class" might be possible). if you break the bridge the main Arduino processor may not be reprogrammable via the usual route. So you probably need an ISP programmer. In fact you will likely need one to change the 8U2/16U2/32U4 anyway. chandrakanth hasn't said which particular "Arduino" (s)he is using. I think some do have a separate USB connection available for the user's application; eg, DUE, Zero ? So have you mastered the basics first? eg, writing and downloading a simple LED blink? Doing a "Hello, World". Given that then what I am suggesting would be a VERY complicated approach. Perhaps V-USB on IO is the "simple" solution here? Esp. the last answer there. So it seems the 16U2 on some Arduino's contains DFU and is therefore "Flip" reprogrammable. That presumably explains OP's mention of Flip in #1 ? I think we need to hear which model of Arduino it is that is being talked about here. Is it one with 8U2/16U2 or 32U4 based? Some of the Teensy's have native USB, and I believe they are also compatible with "arduino". If you're using a micro that has native USB functionality, like the ATMEGA32u4 (Leonardo, Pro Micro...ect) , Arduino has included libraries. See below. This isn't the case for Arduinos like the UNO that use another chip to translate the main microcontrollers UART into USB, because the HID function makes the board not work like a normal Arduino bootloader works. You would have to reprogram the 16u2 chip on the UNO to be HID compliant, and then no boot loady. I've seen some work arounds like having the code for the 16u2 on the Uno look for a jumper/switch and if the switch is there, go into HID or MIDI mode, and if it's not there switch to the bootloader mode. If you have a stand alone programmer then having a bootloader isn't that big of an issue. Sparkfun sells a USBISP based AVR programmer for cheap. Many of this HID/MIDI stuff can be attributed to the work ABCMiniUser's LUFA project. THANK YOU DEAN! We owe you many collective beers. Hello, You didn't say what Arduino that you have, but you need a Leonardo, Pro Micro, or Due for USB keyboard or mouse applications. These three models have the ATmega32u4 AVR that has USB functionality in its hardware. Then try the examples in the Arduino Keyboard and Mouse control section. 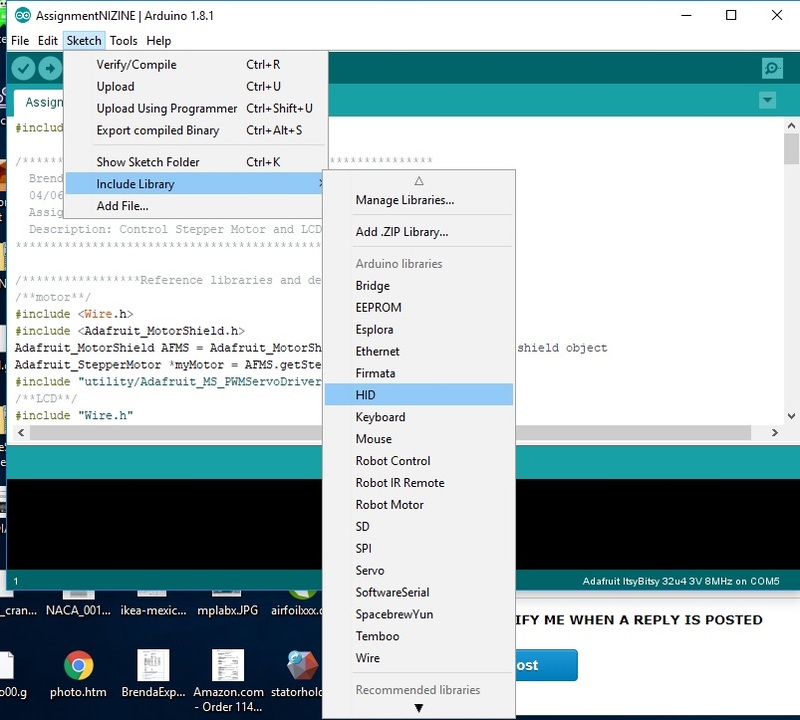 https://www.arduino.cc/en/Tutori... Then read and study the library source code for keyboard.h and mouse.h. And download all the tutorials that you can find on the web using Google concerning USB. Save the advanced ones: read twice the simple and beginning ones. I saw that the library code that allows mouse/keyboard manipulation runs on a Leo, ProMicro, or Due; and assumed that the Due had the same CPU as the other two. My mistake. Still, this Arduino USB approach is the only way that an embedded-systems beginner is able to develop useful monitor/modify applications for the PC's keyboard or mouse. What surprised me in your post is the fact that, usually, you have very wise tecnical raguments and you link them with economical arguments . In your post, you were technically right, but using Arduino Due as a mouse/keyboard is an economical crime , as it never was chinese cloned (things can be worse: as Arduino Due is not 5v tolerant, some hardware shields made for avr arduini can kill the expensive Due) .